March, 1973. The big news since our last story is that, fresh from his historic visit to China and the withdrawal of troops from Vietnam, President Nixon has been re-elected with a massive landslide. While in Doctor Who, we’re already three stories into the show’s 10th anniversary season – albeit, since Carnival of Monsters was made at the end of the ninth season and The Three Doctors was broadcast out of production order, Frontier in Space was actually the first story made as part of the 10th anniversary block. 1973 was a big year for Doctor Who: quite rightly since very few TV series reach that milestone. Even the iconic international success The Avengers only managed nine. Though The Three Doctors, with Patrick Troughton guest starring and with a poignant cameo from William Hartnell, was the big, season-opening headline-grabber, Barry Letts and Terrance Dicks deliberately conceived the whole of the 10th season as a celebration. And having used the season opener as an opportunity to publicly and definitively put the trapped on Earth format out of its misery – although as we’ve seen, in practice they’d already done so 12 months earlier – we get the sense that Letts, Dicks and their writers are delighting in the opportunity to have adventures in space and time again. You’d be forgiven for mistaking the first episode of Frontier in Space for a Tom Baker story – it opens on the kind of spaceship set we’re going to see every year until Season 17 – until the third Doctor and Jo emerge from the TARDIS. Immediately, the Doctor begins trying to take readings, and work out where they’ve landed for his log book. Meanwhile, Jo, ever curious, goes off to investigate. Meanwhile, on Earth we learn that humankind is locked in a cold war with the Draconian Empire, and we quickly see another example of the Pertwee era’s obsession with the rise of East Asia: the enmity of China and the West we saw in Day of the Daleks is playing out again in the 26th Century, because the Draconians are basically Asian people. Frontier in Space plays out like Doctor Who doing James Bond – exotic locations, dramatic reversals in fortune, and a coalition of bad guys playing one empire off against another to cause a war just like every other 1970s’ Bond villain. In itself, that’s a reason to love the story. However, there’s more to it than that. After getting the old Doctors back, this is a celebration of the Doctor’s biggest enemies: it would have been unthinkable for Letts and Dicks to let the anniversary go by without the Master turning up. Delgado is on top form in what tragically became his final story: playing the role with a wry smile, and some magnificent comic touches (I particularly like the way he turns down the speaker as Jo witters on in her cell, so he can concentrate on reading The War of the Worlds). After three years, he’s as much a part of the show as the regulars, and his scenes with Pertwee and Manning are delightful, particularly in their final scenes on the Ogron planet when Jo’s able to resist his hypnotic powers and he’s forced to resort to more underhand methods to gain her cooperation. The three of them make a fantastic team – the only problem being, that’s not necessarily a positive trait for a villain. Though none of the later Masters is anywhere near as charming or as basically fun as Delgado, they’re at least more useful enemies. In fact, when it’s revealed the Master is working for the Daleks, he gains a degree of menace that he’s lacked since the first half of Season Eight. If he’s willing to collaborate with them, maybe he really is bad. Though they’re in this for less than half an episode, this is the first time the Daleks’ appearance has actually been a shock – and the last, until Army of Ghosts pulls off a very similar trick of misdirecting the audience by having two of the big bads in the same story. Most shocking of all, the episode ends with the Doctor being shot, and forced to contact the Time Lords as the Daleks prepare their army for the conquest of the Galaxy. Which basically makes Frontier in Space a six-episode version of Mission to the Unknown. On top of the Daleks, we also get Draconians, Drashigs, Ogrons and the Ogron predator – five strange alien creatures and an evil version of the Doctor in one story, just like The Daleks’ Master Plan. Many, many people have pointed out that with Frontier in Space and Planet of the Daleks, Letts and Dicks are consciously trying to recreate Doctor Who’s most famous epic. Some wag even came up with the umbrella title The Master’s Dalek Plan to describe the 12 episodes. These people are right. If I learned anything from the information text on Colony in Space it was that even in 1971 BBC executives still remembered the Hartnell epic as a high watermark for the show (or, at least, its ratings). But I think there’s more going on in Season 10 than just trying to re-make The Daleks’ Master Plan in colour (or In Color! For any Avengers fans reading). Take the previous story: Carnival of Monsters. In it, the Doctor and Jo get shrunk down to an inch tall, and arrive inside a machine that contains all manner of strange alien beings. It sounds exactly like the kind of story they might have tried in Season Two. The next story is consciously retro to the extent that they bring back Terry Nation, whose last full script was 1965’s The Chase, to write it. Then after The Green Death – an anniversary celebration of UNIT that happens to include a WOTAN style world-conquering computer and some giant insects – we get the first story set in British history since 1966. 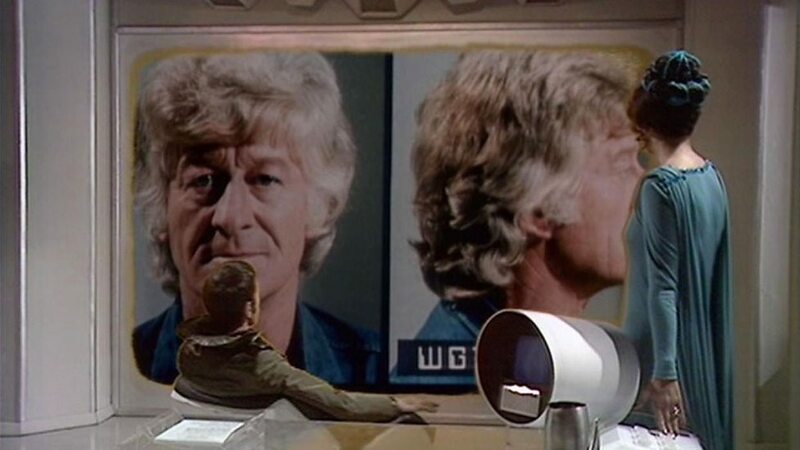 On top of all that, whenever the third Doctor lands in space, the first thing that happens is that he loses his TARDIS (be it pinched by Primitives, falling off a cliff or snatched by the Ogrons). And he has a strange habit of wanting to work out where he is so he can program coordinates into the TARDIS. Meanwhile, Jo keeps wondering when he’s going to be able to get her back home. What we’re seeing in the Pertwee era, once it gets away from 20th Century Earth, is a reversion to the tone of the Hartnell years. Season 10 isn’t just a celebration of Doctor Who’s history, it’s actively trying to make the show like it was in Season Two – the last time it was a runaway hit. The thing is, this works: the ratings for Season 10 peak at 11.9 million viewers, and average is 8.7 million, the highest since 1965. Letts and Dicks didn’t have a big new idea to replace the trapped on Earth formula. They just looked back to the last time Doctor Who was massive, and copied it. That’s why we’ve got the Doctor as an explorer who keeps losing his TARDIS. That’s why we’ve got a 12-episode Dalek epic. That’s why we’re about to get a historical that’s vaguely similar to The Time Meddler. That’s why Pertwee’s Doctor is a citizen of the universe and a gentleman to boot, and not a paranoid cosmic hobo on a crusade against evil. That’s why, at its best, the third Doctor’s era is great: because it reimagines the glory days of Doctor Who in colour – and, when it’s on form, makes them even better. And I think it’s one reason why Barry Letts was so keen to involve Hartnell, even in a very minor capacity, in the anniversary, as a tangible link back to the era he’s paying homage to. In future, other producers are going to look back to go forward, and they’ll pick different eras as their starting points. At some stage, the makers are even going to take the third Doctor’s era as their inspiration. But Barry Letts was the first producer to consciously do so, the first producer to appreciate the symbolic value of the show’s history to the British public, to bring back popular 1960s icons like the TARDIS, the Daleks, the Cybermen and the old Doctors. That’s why I think he’s one of the great producers of Doctor Who: because he saw that the original concept of the series developed by Verity Lambert and David Whitaker was so uniquely brilliant that he wanted to bring the tone of that show back. And because Barry Letts made this the default approach, I think the series will always come back: not just as bases under siege, or an Earthbound Doctor who works for the army and fights aliens but, first and foremost, as an adventure in space and time. Next Time: “The old man must die, and the new man will discover, to his inexpressible joy, that he has never existed.” The fourth Doctor arrives in Robot.